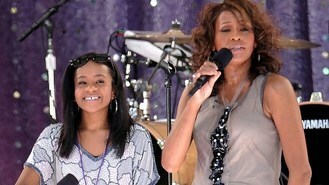 Whitney Houston's daughter has been taken to a Los Angeles hospital for unspecified medical reasons, paramedics said. The Beverly Hills Fire Department says Bobbi Kristina Brown was taken from the Beverly Hills Hilton around 10:30am local time, less than a day after her mother died in a room at the same hotel. The 18-year-old's condition was not immediately known. An email sent to a representative of her father, Bobby Brown, was not immediately returned. Coroner's officials received Whitney Houston's body early on Sunday, but have not yet said when an autopsy will be held. Any cause of death determination is likely to be delayed while they await toxicology results. Stars including Mariah Carey and Simon Cowell have paid tribute to Whitney Houston after her sudden death in a Beverly Hills hotel room. The charts are being graced with musical greatness after two legends soared into the top three of both singles and album listings. Whitney Houston's mentor Clive Davis spoke of his devastation today at the star's sudden death but insisted: "Whitney would have wanted the music to go on. Tributes have been pouring in for American singer and actress Whitney Houston, who has died at the age of 48. Sir Paul McCartney paid tribute to the other "three boys" in the Beatles as he unveiled his own star on the Hollywood Walk of Fame. Whitney Houston, who reigned as pop music's queen until her majestic voice and regal image were ravaged by drug use, has died. She was 48. Tony Bennett performed on the very first Grammy Awards, and as he returns for the 54th show, the singer says it never gets old. Snoop Dogg, Mos Def, Q-Tip, Eminem, Nas and Kanye West are to appear in a film about rap.